This is a brand new picture of Title Update 19 which is going to be the next big update for Minecraft on the Xbox 360, Xbox One, PS3 and PS4 and is coming out really soon and as you all probably already know is that this is going to be the biggest and most awesome update ever for the Consoles. This photo is from the Playstation Experience in Las Vegas which was a few days ago. It seems like the update is being very close to finished seeing that they are able to play the game in TU19 and put so many screenshots again. 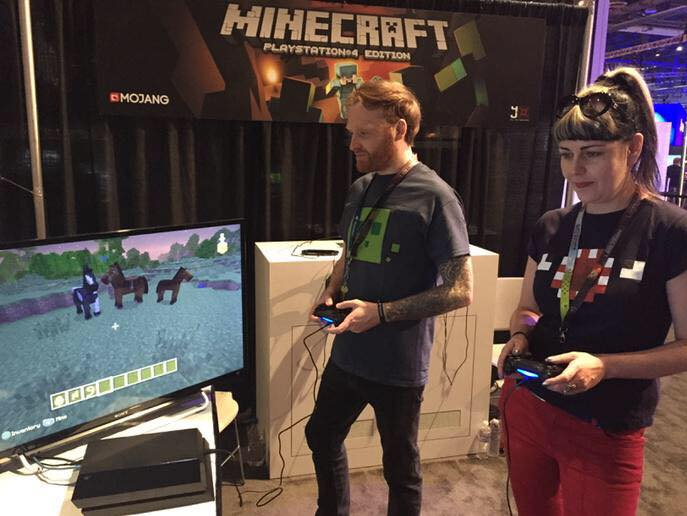 In the picture you can see two people playing Minecraft on the Playstation 4 and as you can see on the screen is that they are playing in TU19 because there are horses which is a new mob that we will be getting in TU19. You can see two brown horses and one black white horse. The picture is not clear enough to see what’s in the inventory, i can only see one thing which is a lead which players can use to attach their horse to a fence for example so it won’t walk away.